Rule #1: Keep your Friday lunch open. 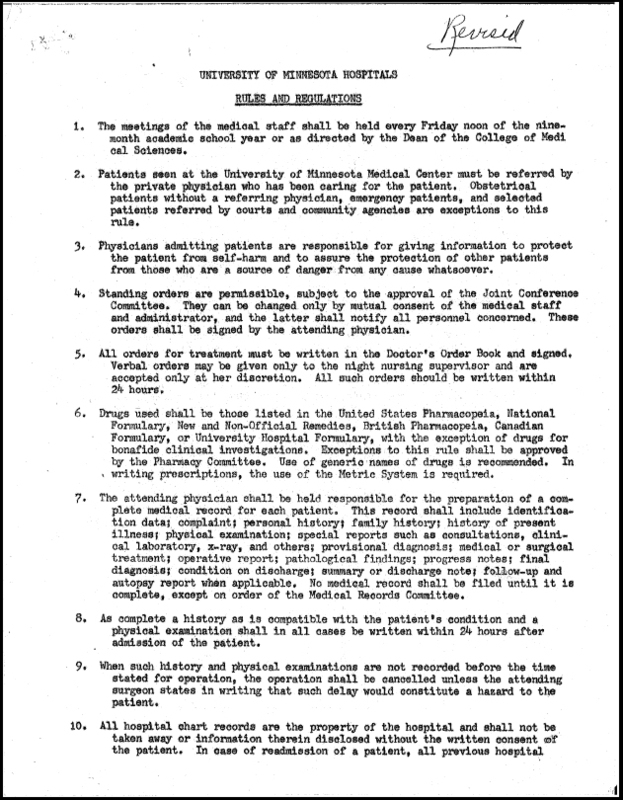 That is rule number one in the nineteen point Rules and Regulations of the University of Minnesota Hospitals approved October 11, 1961. The Rules, approved by Dean Robert Howard and Ray Amberg, Director of University Hospitals, represent a carefully worded outline of expectations and duties for faculty physicians on staff at the University Hospitals. The Rules, however, were not formulated without some criticism and changes. After the Rules were distributed, Dr. Richard DeWall submitted a complaint regarding item number 15 and the need for all staff to secure autopsies. Dr. DeWall responded by expressing his concern that the effort to secure autopsies would surpass their usefulness and that house staff, not the attending physician, could complete the task. Also, note an early version of HIPAA in rule number eighteen. Read the Rules and Regulations below and see you at noon on Friday.